The lasting effects of giving compassionate service. 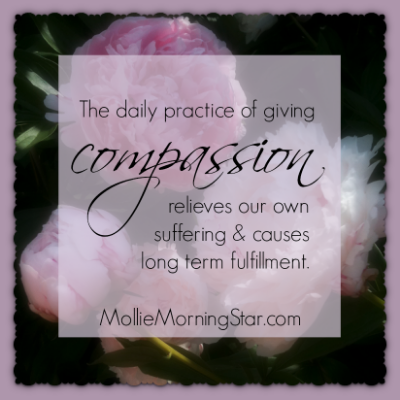 A common trait in people who are thriving after a loss is their practice of compassionate service. When you have traveled down the lonely road of grief, your experience becomes the training you need to serve as a guide for others on that new journey. Here's why compassionate service is important. When we experience a loss of a very close loved one; perhaps an aging parent we were caring for, a child who was our entire existence, or a partner we spent all of our free time with, we are left with a void of time and energy that we used to devote to them. In the past we might have been busy planning and preparing meals, but we are now sitting at a lonely table, looking at a chair only occupied by our grief. Last week I was able to spend extended time with close friends who have lost a child. I was able to see how they still devote loving, parent energy to their child, even though he is no longer present on the physical earth. By reaching out to others, giving of time and energy to those who are newly on the path and suffering greatly, they are active parents. There is no past tense here, their job as the parents of a beloved child will never be over, regardless of whether that child is living or deceased. This brings back a memory of a private session where a man in Spirit communicated to his sister, that from his place in Heaven, he was helping inspire homeless people to better themselves. She said he always had a soft spot for the homeless and gave them money every chance he could. A perfect way to honor this brother's memory would be to give compassionate service to the homeless on a regular basis. 1. First of all, ask the person, "What can I do?" 2. Intuit the situation. What does your gut say this person needs? A meal? A night out? Money? An hour of uninterrupted conversation? Sit quietly with the question of, "How can I serve?" and listen for Spirit to answer you with thoughtful inspiration. 3. Remember that grieving isn't confined to the first few months after a loss. No one ever gets over the loss of child or a beloved spouse. Instead, they find a new way to live. Even if it's been years since the transition, speaking the name of their loved one, and talking about memories is healing to those who never want their loved one to be forgotten. Sending a card or giving a small gift in memory of their loved one is deeply meaningful and appreciated.